Today, the chess playing automaton. The University of Houston Mathematics Department presents this program about the machines that make our civilization run, and the people whose ingenuity created them. I recently read the wonderful book The Invention of Hugo Cabret with my son. The story and beautiful illustrations conjure a surreal world in which a central character is a mechanical man, an automaton. This reminded me of the most famous automaton in history – The Mechanical Turk. 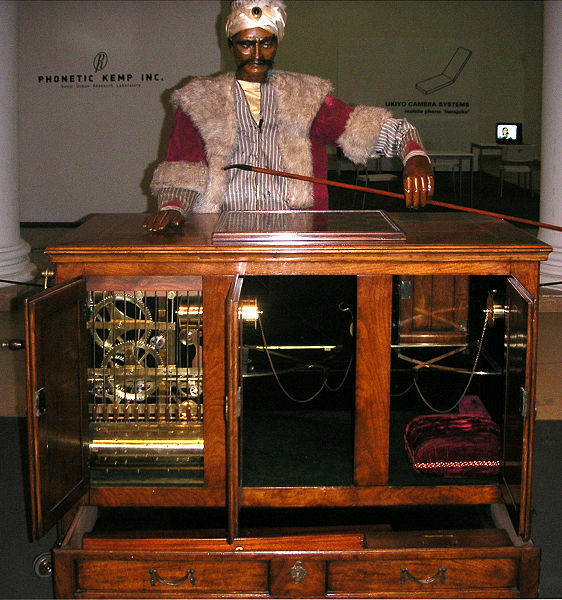 The Turk was touted as an early robot that could play chess at the highest level. Built in Vienna in 1770 by the inventor Wolfgang von Kempelen, the machine consisted of a large pedestal, housing intricate machinery on top of which stood a chessboard. To this box was attached the upper half of a men dressed in oriental robes and a turban. Each performance began with an elaborate introduction to convince the audience that the Turk is really a machine. The automaton would then face a challenger. The Turk first dazzled the court of the empress Maria Theresa in Vienna. The machine moved its own pieces, and would instantly recognize illegal moves by its opponent. It offered a surprisingly good game of chess! The automaton soon became a sensation, toured Europe and North America, and was matched against some of the best chess players of the time. It lost some games, but won surprisingly many. The Turk remained popular after its inventor’s death, even playing games against Napoleon Bonaparte and Benjamin Franklin. 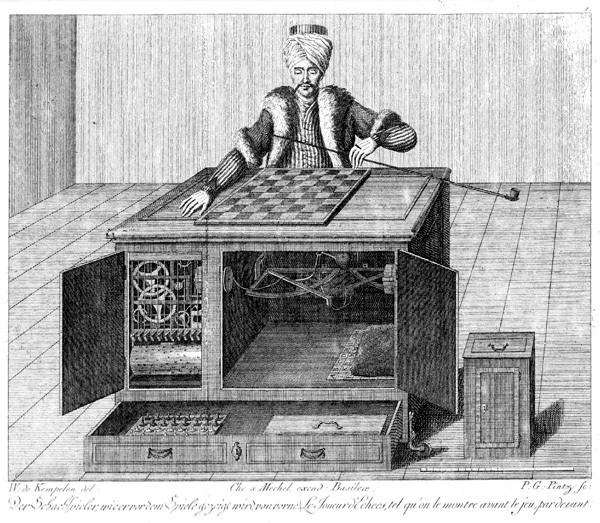 The secret of the Mechanical Turk was kept for over 50 years – the machine was an elaborate illusion, and contained an ingeniously hidden compartment that housed a human operator. This hidden chess master could observe the position on the chessboard above, and manipulate the movements of the Turk. The original Turk was destroyed in a fire, but some of its parts survived. It was reconstructed in 1984 – however, at this time a hidden human operator was no longer necessary. The present incarnation of the Turk is truly autonomous, its moves guided by a chess-playing computer. Today machines can play chess better than any human. But, there are plenty of things that humans still do better. People can more accurately transcribe dictations than computers, and it is still difficult to write algorithms that predict which products people may like. Interestingly, the company Amazon has created an online service to easily harness a large human workforce for such tasks. And they have named this service The Mechanical Turk, after the 18th century chess-playing automaton that concealed a human chessmaster. Businesses can use a slick computer interface to program mundane tasks that are then performed by hundreds of humans. The modern chess-playing Mechanical Turk does not need a human operator. It took 200 years for the hidden chessmaster to become obsolete. And this brings us to an interesting question: How long before we can replace the human operators behind Amazon’s Mechanical Turk with machines? I’m Krešimir Josić, at the University of Houston, where we’re interested in the way inventive minds work. Here is the website of Amazon’s Mechanical Turk https://www.mturk.com/mturk/welcome. Wikipedia has nice entries on both Amazon’s and the original Mechanical Turk. The following entry describes the 1997 match between the reigning chess world champion Garry Kasparov and the IBM computer Deep Blue. Deep Blue won this match http://en.wikipedia.org/wiki/Deep_Blue_versus_Garry_Kasparov. This short video features the reconstructed Turk, and gives some further details about its history http://www.youtube.com/watch?v=RdT4yG8wczQ. Although the word “robot” had not been introduced yet in 1770, I believe that the concept existed. The word “robot” was introduced in 1920 by Czech writer Karel Capek, and it is not quite synonymous with “automaton”. I have a blog at http://kjosic.wordpress.com/, and you can follow me on Twitter http://twitter.com/#!/kjosic. Both images are from Wikipedia: http://en.wikipedia.org/wiki/File:Turk-engraving5.jpg and http://en.wikipedia.org/wiki/File:Kempelen_chess1.jpg. This episode was first aired on January 11, 2011.